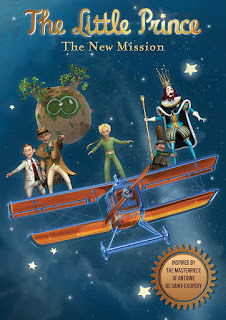 Living a Fit and Full Life: Embark on a New Mission with The Little Prince: The New Mission from NCircle! + Giveaway! Embark on a New Mission with The Little Prince: The New Mission from NCircle! + Giveaway! "When we last saw the Little Prince, he had defeated the Snake by trapping him in his sketchbook. All is calm in the galaxy once again. Life on B612 has resumed to normal. Rose, Fox, and the Little Prince are living peacefully, maybe too peacefully…. Then one night, Rose hears the Snake telling her that she has a home planet with a family and it sounds like they are in danger. Can this be true? Can there be a Planet of the Roses? Rose asks the Little Prince to find her planet and fast. The Little Prince promises Rose that he will go look for her Planet of the Roses. He asks Fox to keep an eye on Rose as he flies off on his plane. The Little Prince promises he will return soon to trim teh baobabs on B612. During his quest to find the Planet of the Roses, the Little Prince encounters four new characters: the hunter, the geographer, the king, and the businessman. As he meets each one, they tell him that Rose's planet is in another galaxy far beyond interstellar space and offer to help him find the planet. Meanwhile, back on B612, the baobabs continue to grow, Rose and Fox continue to argue, and then the Snake is freed from the sketchbook! Upon the Little Prince's return to B612 he learns of Snake's escape and realizes he must set off on a new mission to fight his worst enemy again. Will he succeed? Will he ever find the Planet of the Roses? Embark on a new mission with Little Prince and friends!" Embark on a new mission with The Little Prince: The New Mission from NCircle! The Little Prince: The New Mission from NCircle is an absolute hoot. Even I found myself sucked into the adventures of Little Prince. The characters throughout are incredible fun and all have their own fun personalities. My kids love watching this DVD and have been asking to watch it over and over again which is always a true sign of a DVD that they love. 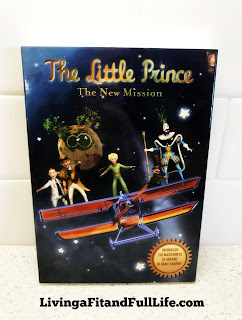 The Little Prince: The New Mission from NCircle is the perfect way to entertain the kiddos and my family and I absolutely love this DVD!